Apparently, I received my Cheeky Umbrella at the most perfect time possible. It has been raining here for 48 hours straight. Since I have to take the dogs out at least 3 times a day, I have gotten great use out of it. I was sent the long "It's Raining, It's Pouring" umbrella from Cheeky Umbrella for review. The Cheeky Umbrella that I received is by far the best quality one that I have ever used. I usually by the $3 umbrellas and finally got a great quality one. The handle is a slip resistant hook handle. It feels old fashioned because it's so long and I love it. It opens with the push of one button and is so sturdy. The other umbrellas that I've had in the past flip and break with strong wind and this one can make it through anything. The umbrella is also very easy to close and closes with a pull down. Also, it dries fast which is nice. The company sells tons of cute patterns and I love the colors of my new black and pink one. I am very impressed with Cheeky Umbrellas! Cheeky Umbrella is going to be giving away an umbrella of your choice to one lucky reader! I'd want the Shopping Weather long umbrella. The purple and black color combo is great! I like the Raining Men long umbrella the most. I like the Cocktails Long Umbrella. I like the Raining Men Long Umbrella...so pretty! The Shopping Weather Long Umbrella. 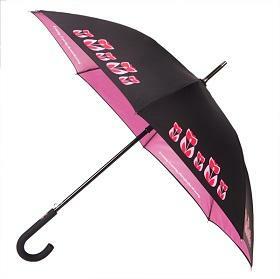 I like the Raining Men Compact Umbrella. I like them all, but the Shopping Weather pattern is my favorite. I like the sizzle umbrella. i love the cocktails umbrella! I love the green and black curls umbrella! I would choose the Raining Men umbrella. I like the Raining men umbrella.Thanks for the chance. I like the Still Cute kids umbrella. I really like the Sizzle Long Umbrella! I like the Green And Black Curls Long Umbrella. The Green and Black Curls is my favorite. I like the Shopping Weather Long Umbrella! This is such a fun giveaway with such pretty umbrellas. Should I be fortunate enough to win I would adore the "Raining Men" long umbrella. I mean....what's not to like? Thanks for the chance to win. I would love to win this! I like the cocktails long umbrella! Thanks so much for the fantastic giveaway! I like the Green and Black Curls Auto Compact Umbrella. The cocktails umbrella is my favorite! I like their black long umbrella. I love the Sizzle umbrella! I like the long shopping umbrella in the black and purple paisley. I love the Cocktails long umbrella-pretty! Christina - xristya@rock.com - Shopping Weather Long! My fave is the Sizzle Long Umbrella! I like the Cocktails long umbrella! i really like the sizzle long umbrella. its adorable. I'd like the Poppies Clear Umbrella. I like the clear Poppies umbrella! Classic white handle. i LOVE the raining men long umbrella! I love the Polka Dots Clear Umbrella. I LOVE the Raining Men umbrella. Love the yellow lining, so cheery on a rainy overcast day. My favorite is the Pink Auto Compact Umbrella. I love the "It's Raining Men" long umbrella!